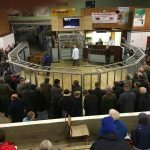 Stirling – Caledonian Marts Ltd on Thursday April 4 sold 175 cattle comprising of 79 prime bullocks, heifers and young bulls, 61 OTM cattle and 35 calves. Prime heifers reached 250ppkg for an Aberdeen Angus from DS and RC Taylor, Easter Ochtermuthill, Muthill purchased by The Buffalo Farm, Boglily and to £1539 for a Limousin from W Dandie and Sons, Learielaw purchased by H A Black and Sons, Butcher, Stirling. Prime bullocks peaked at 242p for a Limousin from Learielaw, purchased by T Johnston, Butcher, Falkirk and to £1598 for a shorthorn from H A Brown, Molemount, Galston. Young bulls sold to 212p for a Limousin from M Jack, Carriston, Star of Markinch and to £1428 from the same home. Fleshed beef OTMs averaged 156p selling to 178p for a Limousin from W Dandie and Son, Learielaw, Broxburn and to £1400 for the same beast. The overall average for Beef OTMs levelled out at 148ppkg. Dairy cows averaged 109ppkg selling to 131p from A Sibbald, Greenrigg and to £920 from J Johnston, North Medrox. Also forward were 35 calves and stirks. With a large ringside of buyers in attendance, all classes were in high demand, and more could have been sold to sellers advantage. Topping the sale was a cracking one-month-old British Blue cross bull calf from Stewart Farms, Balglass, Lennoxtown fetching £370. Stirling – United Auctions on Thursday April 4 sold 6751 prime sheep consisting of 12 new season lambs and 5803 old season lambs selling to an average of 200.14p and also 936 ewes and rams. Old season lambs (5815) – Luckenburn (BTex) £126, Gillbank & Girvan Mains (Tex) £114, Boghall (Suff) £105, Nether Strathkinnes (Chev) £101.50p, Pityot (ChevX) £100, Craigend (X) £99, Kilmundie (BF) £97, Raecruick (Mule) £95.50. Old season lambs (5815)- Luckenburn (BTex) 288ppk, Girvan Mains (Tex) 259ppk, Gillbank ((Suff) 254ppk, Wardhead (Chev) 228ppk, Tigh-Na-Blair (X) 224ppk, Cadogan (Mule) 204ppk, Jaw (BF) 211ppk. Ewes (936) – Humeston (Tex) £145, Southfield (Char) £120, Broomknowes (Suff) £117, West Mains (Chev) £94, Lecropt (Hamp) £94, West Lundie (BTex) £90, Kilmundie (BF) £80, West Lundie (Mule) £80. Rams – Townhead (Tex) £110, Langside (Suff) £99, Wester Clunie (Char) £89. 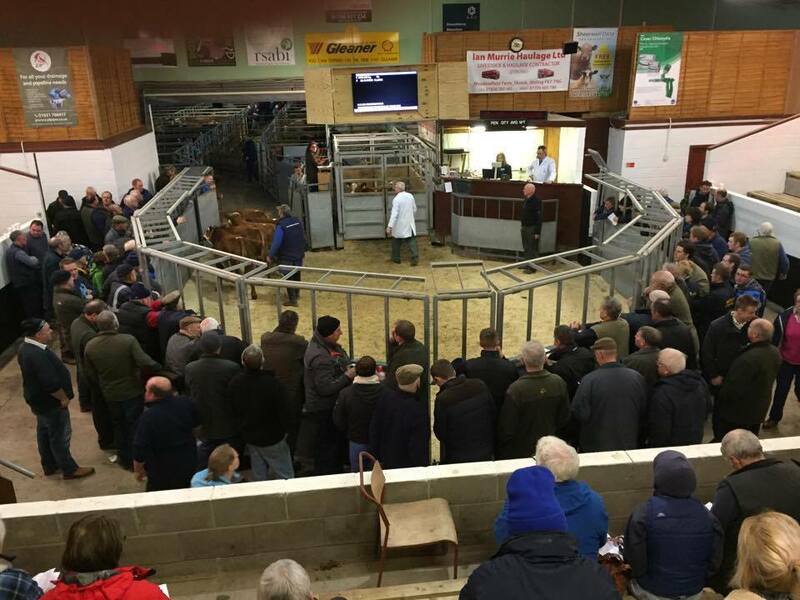 Dingwall – Dingwall and Highland Marts on Thursday April 4 sold 5,674 sheep of all classes including the annual spring sale of ewe lambs. Ewe lambs (3,266) averaged £73.26 (+ £3.44 on the year) and sold to £138 gross for a pen of Cheviots from Suisgill Estate, Helmsdale. Wedder lambs (2,072) averaged £63.65 and sold to £105 gross for a Texel from Hollies, Beauly. Ewes (243) averaged £49.70 and sold to £97 gross for a pen of Texel crosses from 3 Balnabeen, Conon Bridge. Breeding (one) sold to £110 gross for a Roussin ewe with a Dorset cross lamb at foot from Burnbank, Invershin. Rams and feeding sheep (92) sold to £99 gross for a pair of Blue Faced Leicester rams from Gorthleck Mains, Gorthleck. Ewe lambs: BeltX – Marian, Evanton, £108, Simpsons Croft, Scotsburn, £103, 13 Kirkton Gardens, Lochcarron, £95.50; TexX – 3 Balnabeen and 4 Drumloan, Drumnadrochit, £100, Keppoch Farm, Dundonnell, £99, 13 Kirkton Gardens, £86; RouX – Hollies, £100; Chev – Shieldaig, Strathcarron, £94, 1 Wester Alligan, Torridon, £93, Rydon, Tain, £91, Inchbae Farm, Garve, £90; Cross – Balnabruiach, Ardgay, £89, Acharry Muir, Dornoch, £75; Zwb – Mariain, £88, Carn Raineach, Applecross, £75; LlyX – Strone Farm, Banavie, £85 (twice); Mule – Dalmagarry Farm, Moy, £83; SuffX – Craigton, Bonar Bridge, £82; Swl – Breakachy, Laggan, £79; CHM – 13 Kirkton Gardens, £77; BF – 12 Annat, Torridon, £76, Breakachy, £74. Wedder lambs: SuffX – Bogallan, North Kessock, £100, Torgrianach, Ullapool, £86, Mid Fearn Farms, Ardgay, £83.50; TexX – 77 Feddon Hill, Fortrose, £93, Balblair Farm, Dingwall, 5C Balnabeen, Conon Bridge and Edinbane, Portree, £88, Ballone, Abriachan, £83; Chev – Dundreggan Croft, Glenmoriston, £90, 186 Migdale, Bonar Bridge, £89, Inchbae Farm, £86.50; Zwb – Linside, £87; BeltX – Dalmagarry Farm, £85, 5 Totarder, Struan, £82.50, 6 North Bragar, Isle of Lewis, £78; BF – Galmore, Roy Bridge, £81.50, 1 Horgabost, Isle of Lewis and Satran, Carbost, £75.50; BFL – Linside, £80; Cross – Satran, £79, 7 Reef, Uig, £76, 46 Balallan, Isle of Lewis, £74; CharX – Clune Farm, Aldourie, £76.50; RouX – 15 Port Henderson, Gairloch, £69.50; LlyX – Corrimony Farm, Glenurquhart, £68. Ewes: Cross – Rhevackin, Kiltarlity, £85; Chev – Torgrianach, £81, Cartomie, Ardgay, £74, 15-16 Achvrail, Rogart, £63; LlyX – Ardgayhill, Ardgay, £80.50; TexX – Ballone, £78, 3 Balnabeen, £69; Mule – Rhevackin, £72; SuffX – Rhevackin, £66; BeltX – Dalmagarry Farm, £60; BF – Dalmagarry Farm, £58; CHM – Ballone, £55. Rams and feeding sheep: Chev – Muie and Rhein, Rogart, £96.50, Meddat Farm, Kildary, £95, 11 Stirkhill, £87; DorX – 11 Stirkhill, Inverasdale, £87; Tex – Balblair Farm, £84; LlyX – Ardgayhill, £77.50; BF – Saluscraggie, Helmsdale, £65, 9 Sasaig, Teangue, £63, Gorthleck Mains, £60; Cross – 25 Fasach, Glendale, £59; Zwb – Old School, Lochcarron, £58.